FROM SOUTH: From SR-14, take the Rosamond Blvd exit heading East. Once through the gate, continue to Lancaster Blvd. Turn left, go .4 miles and turn left again onto Fitzgerald Blvd. Go 2 blocks and make a left on Coliseum Rd. 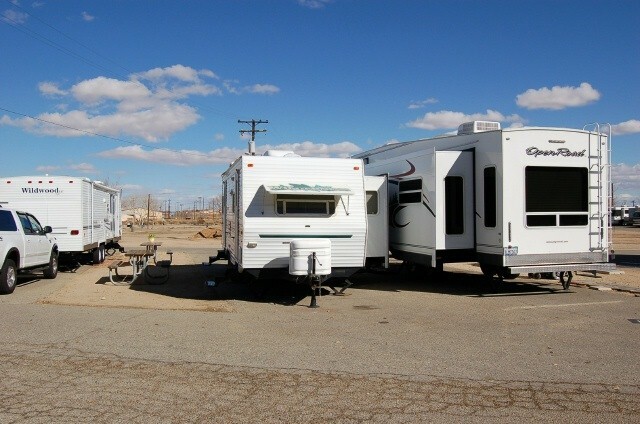 FamCamp is located behind the Bowling Alley on your right on Lathrop St. -- FROM NORTH, WEST, or EAST: From SR-58, take the Rosamond Blvd exit heading South (Edwards AFB exit). When approaching the base gate, stay in the far right lane (marked for trucks), even if there is a cone in the road. They will move the cone for you. The other lanes are too narrow for a full size motor home. Once through the gate, continue to Lancaster Blvd. Turn right, go 3.5 miles and turn right again onto Fitzgerald Blvd. Go 2 blocks and make a left on Coliseum Rd. FamCamp is located behind the Bowling Alley on your right on Lathrop St. -- ALL: Self registration is at the welcome sign. 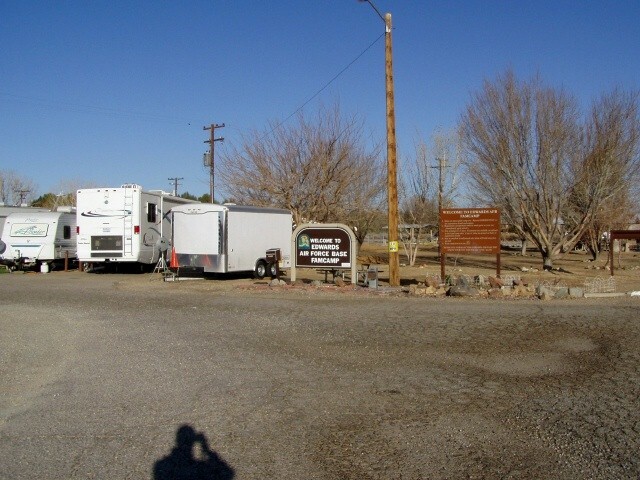 Free WiFi available in the campground and at the BX. Pets allowed with usual leash and clean-up rules. Can only be walked away from the campground on OUTER ring only. Prices are higher for DoD Civilians. 90 day stay limit, then you must be out for 14 days before returning. From June 1st to September 30th, there are only 15 sites available plus 2 sites just for overnight. Dump station is available. Overflow can only be used if FHU sites are full. Self registration at the welcome sign. Check back of board for available sites. For the USAF Frequent Camper log, either keep and submit your receipt or get your logbook stamped at Outdoor Recreation. Edwards is out in the middle of nowhere and as a result, I believe $30/night is too costly. 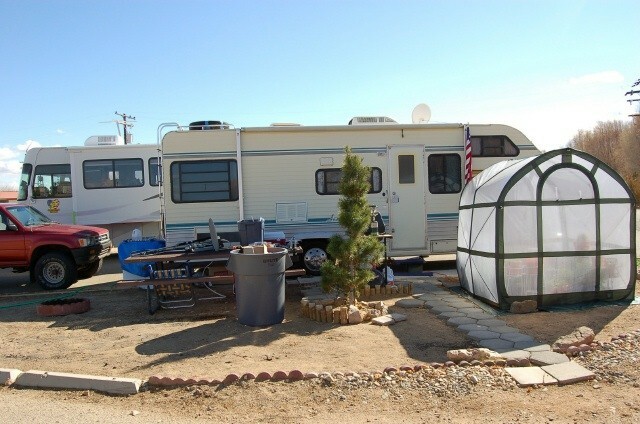 The only reason I came here was to store my RV for the winter and that worked out fine, but in my opinion, the Famcamp is not very good value. There really isn't an office, but one has to find the MWR office, and arrange your stay. Unless one has a specific reason to visit Edwards, I wouldn't visit this Famcamp. All the previous 2018 comments about recent conditions are unchanged and definitely could be improved. Drove thru on Friday the 18th of May, just to see how bad it had become. WOW, what a dump. We used to stay there when traveling with our 5th wheel. Would not recommend this dump to a homeless person. Weeds are taking over and the electrical problems have still not been fixed. (since 2005) It is hard to believe that this place could get worse, but, it did. MWR people need to get fired. They fired the host, that took care of the place, and it shows. My thoughts was the place was abandoned at first sight. There were very few campers on site. The famcamp needs some attention from the powers in charge. Several of the sites are closed due to inoperable utilities. 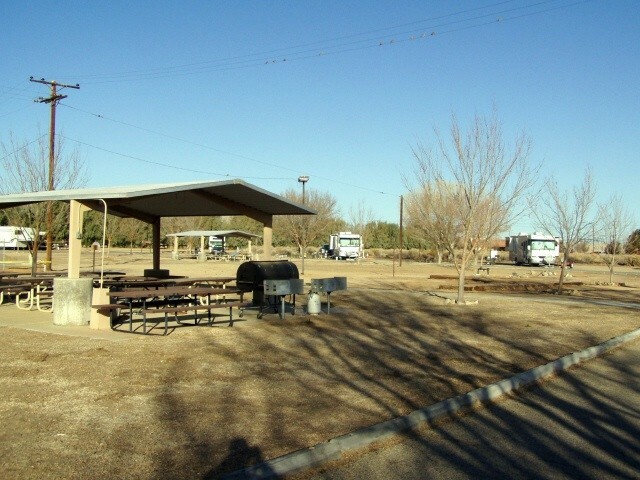 This famcamp has great potential with the right management and maybe a lower price. The write-up below is accurate. I guess I should have known Friday the 13th!! The only reason that we visited was because we participate in the Air Force Frequent Camper Program (Edwards completed tier 4). To say the place is unkempt is being kind. It looks abandoned. There was no indication that there was an employee on site. No posted signage and when I asked one of the 5 campers what the procedure was I was told to find an unlocked utilities box and use the self pay. A call to MWR (we needed to get the AFFCP booklet stamped) revealed that there is an employee on site. There is a discarded tent in the tent camping area alongside the sidewalk leading to the BX/Commissary complex along with a LOT of trash. Tumbleweeds abound and the picnic tables look as though someone has deliberately damaged most of them. A phone call to the Services commander's office is on the agenda. Someone needs to be apprised of how this reflects on the base in general. We were told that the price increase to $30 was to discourage long term campers. There is a limit of 30-day stay (don't know who would do that) followed by a 14-day absence and then return for 30-days and not to exceed 90 days in a calendar year. 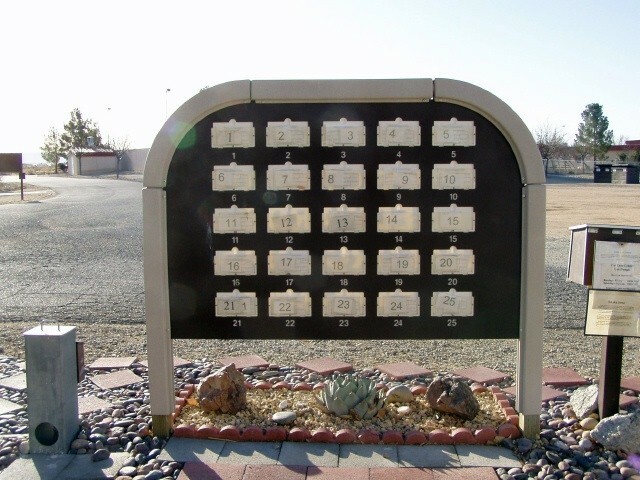 An on-site host is direly needed but one that will take pride in the campground. We stayed here twice before about 17 years ago, and it was very nice then. This time it wasn't worth the long drive in from the interstate. We were told there was no electric when calling for a reservation, but cost would be $25, and so long as spaces were open we could not dry camp in overflow. We arrived in the dark, so just pulled into a spot and did not hook up. There was nobody to pay or register with. In the morning I saw how unkempt the place was. Apparently nobody bothers to maintain the place. The cap for the sewer pipe was on the picnic table. Yuk! The bathroom had not seen proper ongoing maintenance since the last time we visited, it appeared. As the other reviewer mentioned, the urinal just flows constantly, a fire alarm chirps constantly, the place needed a good cleanup, paint and repairs. What a disappointment! We left early morning, so the office, wherever it was, would not have been open, so we just left. It would not have been worth $5, so we just left. The base/MWR needs to shake up this place! Gas station had diesel, so that was the only excitement in this visit. The policy of 'no overflow parking unless all hookup sites are filled' is now being strictly enforced. Prices on full-hookup sites is now $30/night and partial-hookups (water only) is $20/night. Overflow has gone up from $5/night and is now $10/night. The laundry room drain cannot handle the only two of three operating washing machines draining at the same time, so guests are urged to stagger start times by 10 minutes. The air conditioning is always on in the laundry room. The urinal in the men's room is always running and overflowing. 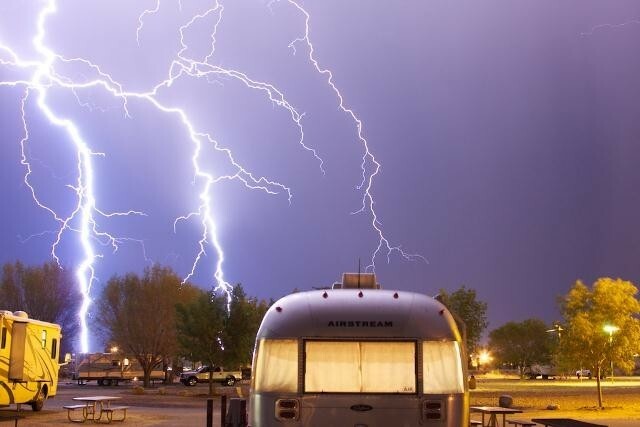 The partial-hookup spots are actually supposed to be full-hookups, but civil engineering hasn't fixed the electrical which was damaging AC units on some visitor's campers. The camp host was unceremoniously relieved of his post, and now an attendant from Outdoor Recreation (ODR) is in the office between 8:30am-4:30pm. If you arrive late at night, you are expected to find a vacant full-hookup spot (even if you don't require hookups) and park there. Then you must self-report to ODR if the attendant isn't available. It is against local Field Services Squadron (FSS) policy for folks to use overflow even if they are in a POV (car, truck, jeep). This is a bit sad due to a few airmen who are mostly deployed tend to use FAMCAMP while at permanent post for the month or two when they are not deployed (thank you for your comments about homesteaders). 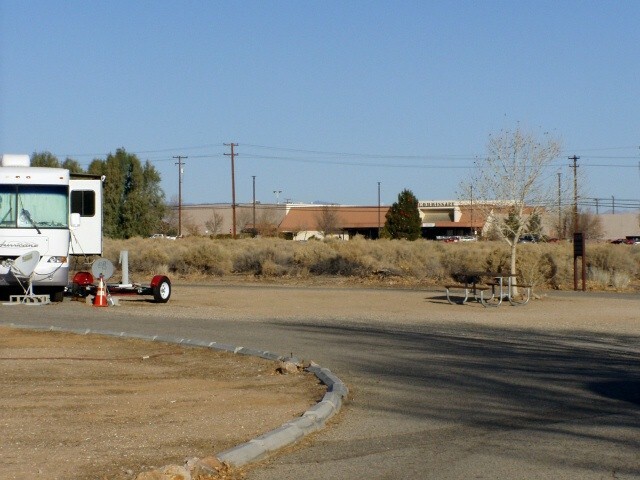 The scenic vistas from this Campground consist of the rear of the bowling alley, unkempt desert landscape, tumbleweeds, and a few drainage ditches. To be fair, they did fix the WiFi and there is basic cable in the TV room now. There it is folks. Don't shoot the messenger. This FAM Camp is a Comical, Disaster. The Registration box is empty & the sign reads "check in with Camp Host". We talked to a couple of people & there is NO Camp Host. Twenty Four spaces "OUT OF SERVICE" & the all the operating spaces are full of Active Duty & long term "Squatters". Overflow is a paved parking lot with a strong Sewer odor & NO Directions to the Outdoor Rec. for paying the $5.00 fee. Good stopping point when traveling to Desert Parks & the PX & Commissary are good plus you can fill up your RV with Diesel at the Gas Station. Seems that about a third of the camp sites are down due to electrical power issues and have been down for some time. 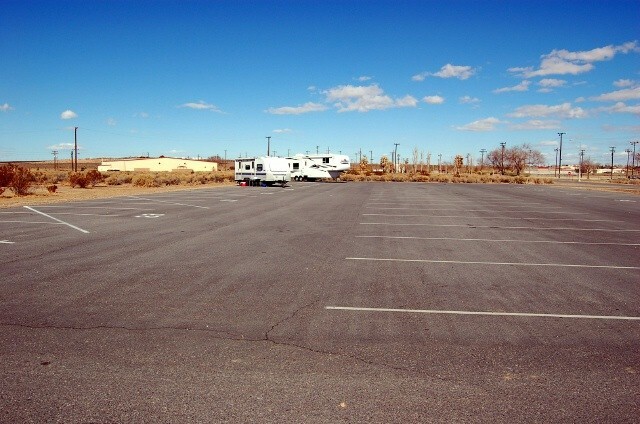 We only stayed overnight and had to boondock in the overflow parking lot for $5. Not an issue for us but the strong smell of sewage was with us all night meaning the windows had to stay closed and made it a little uncomfortable. They do take reservations so call. Stayed at Edwards FamCamp Sept 24. What a mess!!! If it weren't for security and access to BX/Commissary, we would have found someplace else. Ended up boondocking in overflow lot. Half the camp is out of order because of electrical issues. Lots of homesteaders. Laundry, restrooms and Day room all in need of attention. 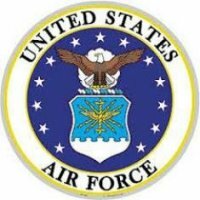 We've been to quite a few Air Force FamCamps and this is by far the worse. Well, just when you think things can't get any worse! Just go visit Edwards. They fired Andy and Mary who were the only ones that did anything there. You now have to go to outdoor rec to sign in and they have put surveillance cameras around the entire famcamp and in the recroom. The furniture is gone. The 10 new sites are in and are very level, but hard to get in and out depending if someone is next to you. Some are for small units only as they did not cut the trees back or remove the signs that are blocking some sites. 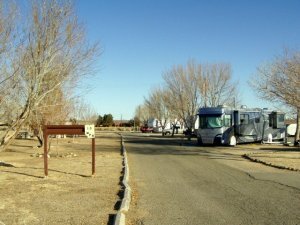 No new or updated bathrooms or laundry for 10 more RVs. Out of the 3 new washers that were put in, only one works. The good thing is you don't have to put any money in the one that works. The management only cares about making money with no support. Things must have changed around here a lot since the previous reviews. We did not see any homesteaders, and the sites are level and graveled. Andy is a gem. When we called from Paso Robles he assured us there were plenty of sites available for a Monday arrival. Our plans changed and we arrived on Sunday instead - no problem. The access to the Bx/Commissary couldn't be better - there is even a walkway in case you choose to use your feet instead of a car. The only reason we are only staying a few days is because of the poor internet signal. This could be a Verizon problem, or due to the high winds a couple of days ago, no way to know. I work from the coach, so internet is vital. Other than that, no complaints. A lot of homesteaders, and contractors. Hard to get a space. No reservations. Andy does his best but no support from Services. Now, sites 21-25 are closed for upgrade and addition of 10 new spaces. Phase 2, (whenever that happens), will add 15 new sites in the field behind the famcamp. This place is a dump! Now they charge $20 when the price should be $5. 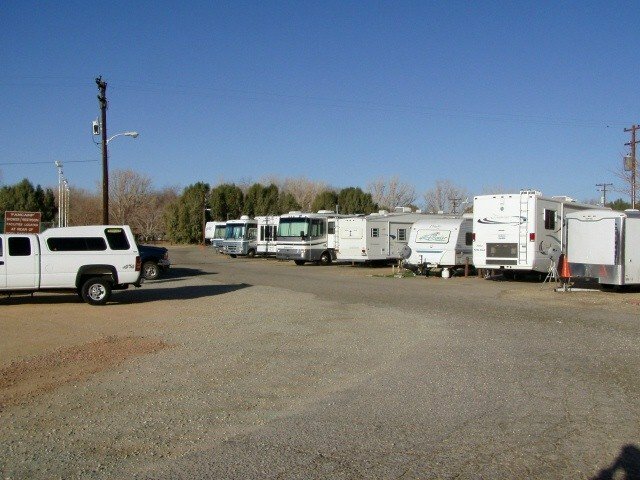 We were lucky that we were able to get one of the 2 spots open and from reading the posts below, there is no reason not to expand if RVers are forced out to the over flow. The parking spots for the RVs are uneven, which should have gravel if not concrete. The asphalt on the site we were on looked like it hadn't been resurfaced in years. This is one park that looks like it's totally ignored. I would not recommend anyone to come here. The camp host was great. 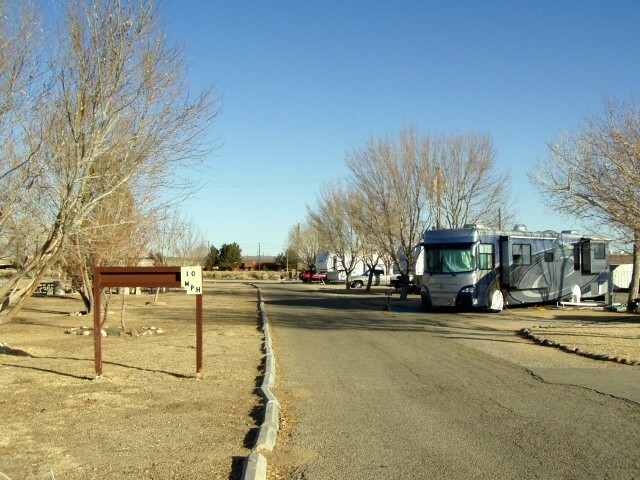 As you can see by the photos, this Famcamp is more of a close-quarters RV parking area. This is not a good place. 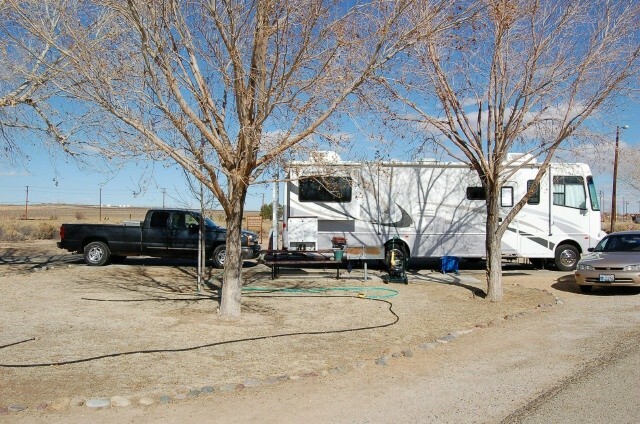 There is nothing special about the individual campsites except they do have FHU and the price is reasonable. The Famcamp will work for an overnight stay although I will avoid it in the future. If you do decide to go for an overnight stay, I would recommend parking in the overflow area. The commissary and exchange are right across the street within easy walking distance, which was the best part of my visit. 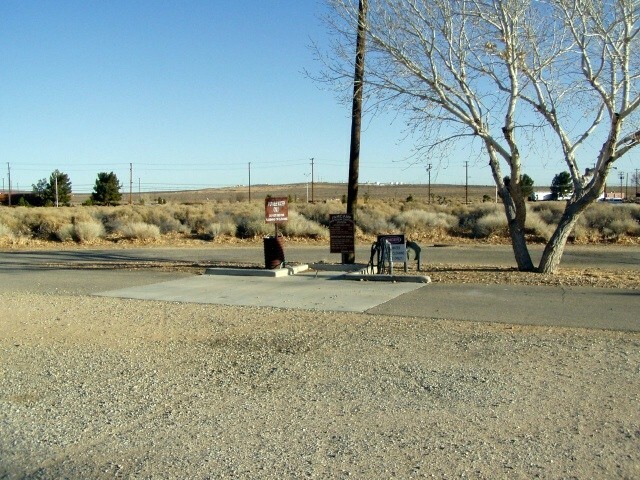 There is also a gas station/shoppette right there and a car/RV wash area nearby. There is an aviation museum close by which I'm sure is worth a visit. I believe the majority of the "campers" here are semi-permanent residents (homesteaders). The place has the feel of a low-rent trailer park if you catch my drift. I can only think that adequate housing must be difficult for this group. You have to wonder what the folks in the MWR office are thinking. I can't give any higher ratings because I always end up in overflow. This camp is full of good old boys/DOD/??? who homestead. it is a waste of time to think it is worth the drive from the highway to stay ----- unless you have no need for hook ups and just want to park in overflow. it isn't even a reasonable distance from overflow to the restrooms/laundry building. I don't mind having to share and end up in some famcamps ONCE IN A WHILE that are full but this one is for the record books. The only reason we come back - to dry camp of course - is because there is damn little between Bakersfield and the Inland Empire around San Bernardino. This time, we are parked in overflow along with a young family that is PCSing. They should not have to be in overflow with homesteaders taking up all the sites!!! This was our first time visiting this park. We called & were told all spaces were full but the camp host told us to call when we arrived which we did. We were told to pull behind his space & plug into the 30 amp on his hookups & as we were just looking for overnight this worked great for us! The camp appears to be full of long-term campers so the reality of a space being available is probably pretty slim. We did not use any facilities but shopped at the commissary, which was very nice. This would be a good spot to just overnight but it is not close to anything of interest. We did enjoy driving around looking at the base. Been visiting this camp ground for the past 20 years and never had to use the overflow area. This was the first time. The new stay for 90 days has closed the park to the traveling people. The park looked good. Green grass under the trees. Camp host came out and told me camp was full and that I would have to use the overflow. Oh well, if these reviews do anything to improve the facility it's worth writing a review. 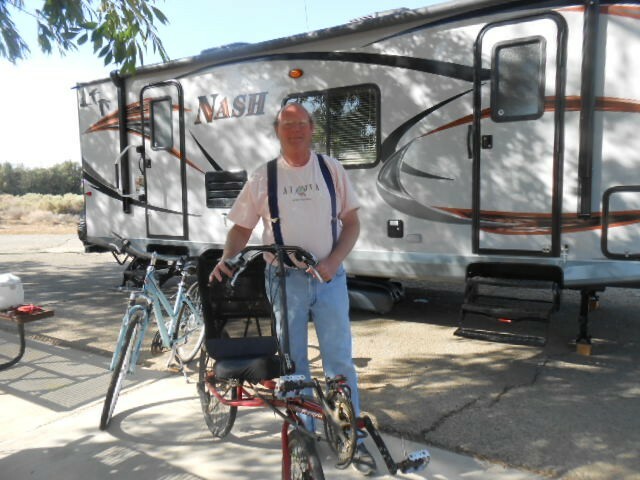 The Famcamp has been taken over by full timers the base CO changed to maximum stay from two weeks to 90 days with unlimited renewals and extensions, contractors and homesteaders took over the camp. We have stopped there three times in the last year and have been forced to dry camp each time. Directions from SR58 need updating. Take the Edwards AFB Exit. Use the right hand lane at the gate as originally indicated. From there on, there are signs directing you to FamCamp. 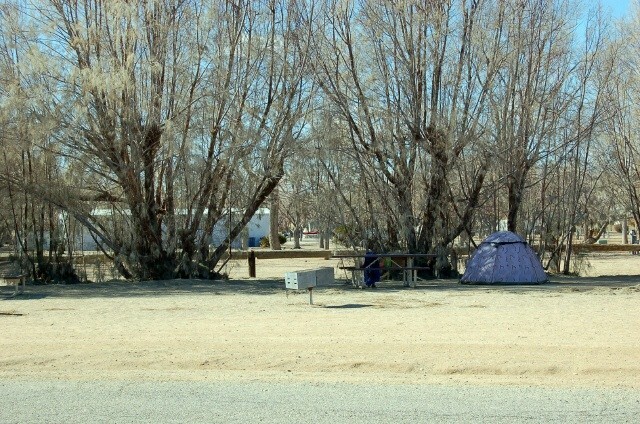 The campground is Spartan, but adequate for a couple of days...especially for $17 a night. It definitely could use some sprucing up. After staying at the Davis-Monthan and Nellis FamCamps, this is a letdown, but different commands, different budget priorities. Host was very nice and helpful. I called the day before arrival to check on availability. We didn’t stay at Edwards this time due to all the RV spots being taken. However, I feel compelled to write a review anyway. If ever a military famcamp has hit the bottom of the sewer, this one is it. First, there are several long-time “residents” staying there. I counted 11 rigs that appeared to have been there for some time and I spoke to a gentleman who said most of them are DOD contractors who are working on Edwards. I can’t verify that but I can say that there is junk laying all around and under several of those RV’s. Secondly, the circle in the center of the park has weeds grown up to at least two feet high. At one time the area was kept neat and clean but not anymore. When we arrived, I looked on the board where you check in and noticed two sites were not paid for, #10 & #20. Site 10 was being taken so we checked site 20. There was a home-made “occupied” sign in that site. Technically, we could have removed the sign and parked there but we didn’t want to get in a big p&^%%ing contest so we just left. Andy, the camp host is not in the park as he works full-time and is not available to during the times he is needed. I feel that Edwards really needs a “hands on” host who is there during hours that RV’er need assistance. and possibly take care of the park. I plan to write a letter to the Wing Commander about the deplorable conditions at the famcamp.